This item was published with Scientific American by PomegranateKids®, an imprint of Pomegranate Communications, and is CPSIA compliant. From the Moon, our closest neighbor, to the smallest planets (called “plutoids”) in the outer reaches of the solar system, the 34 images in this memory game feature celestial bodies both familiar and far-out. Instructions for play are printed on the bottom of the sturdy, reusable box, which neatly stores cards between games and includes a 40-page information booklet with details about the featured artwork. 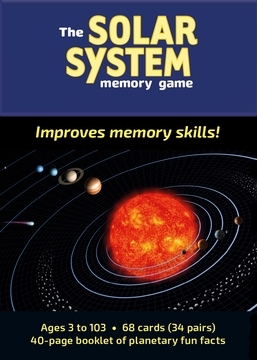 Kids of all ages can enjoy playing the game and learning about astronomy from the accompanying booklet.